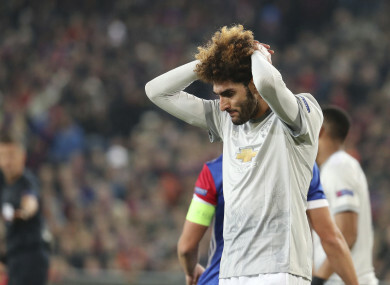 Man United's Marouane Fellaini shows his disappointment against Basel tonight. MANCHESTER UNITED ALMOST certainly won’t be left to rue tonight’s 1-0 loss to Basel. It would be a huge surprise if United do not at least get the draw required at home to CSKA Moscow that would see them go through to the last-16 and top the group in the process. However, that factor does not excuse tonight’s poor display. The visitors dominated the first half and looked well in control, as both Anthony Martial and Romelu Lukaku wasted decent chances to score. Nevertheless, buoyed by a passionate home support, the Swiss side improved after the break, and were ultimately rewarded for their gutsy display with a late goal. United have far more talent at their disposal than Basel and, as boss Jose Mourinho noted afterwards, should have made their dominance tell in the first half. The fact that they allowed their opponents to grow in self belief and ultimately lost this game is a sign of complacency more than anything else — the Red Devils appeared to settle for a draw after the break and were duly punished for their lax approach. It is by no means a disaster, of course, but a mere inconvenience, as Mourinho now surely cannot afford to rest many players in the final Champions League group game. 2. Is there more to Messi decision than meets the eye? There was a surprise tonight, when the teamsheet for the Barcelona-Juventus match was revealed. It was a rare instance whereby Lionel Messi was fit to play but had to be content with a spot on the bench. It is the first time Messi has taken his place among the substitutes since October 2016 against Deportivo and on that occasion, he had only just returned from injury. Yet it seems fair to assume that Barca are telling the truth when they suggest the player, who came on for Gerard Delofeu in the 56th minute, was merely being rested. At 30, the Catalan side are surely increasingly aware of the need to carefully manage their superstar. Tonight was not a game they needed to win, and ultimately, they secured the draw required to guarantee their place in the Champions League knockout stages. In addition, they have a busy schedule prior to the Christmas break and an especially big game on Sunday, away to second-place Valencia, who trail Ernesto Valverde’s side by just four points. Consequently, the decision to keep Messi in reserve seems logical rather than controversial. Moussa Dembele put them ahead after 56 seconds, but it was pretty much all downhill as far as Celtic were concerned from that point on tonight. The Scottish champions were ultimately thrashed 7-1 by PSG. The French outfit are rightly considered one of the favourites for this season’s Champions League. According to Opta, they have now scored more goals in a single group stage than any other side in Champions League history — and with one game to spare. Yet PSG’s brilliance should not excuse Celtic’s awful showing. At the very least, Brendan Rodgers’ side should be expected to make themselves difficult to beat in these big games. The match summed up a difficult campaign for the Scottish side in which they have been largely outclassed — 5 goals for and 17 conceded emphasises the team’s struggle to make the step up against Europe’s elite. They could still end their campaign on a high, however. A draw against Anderlecht in their final match will guarantee them the consolation prize of a place in the Europa League. With just one gameweek left in the Champions League, it is likely that all five English clubs will take their place in the knockout stages. A comfortable win against Qarabag saw Chelsea join already-qualified Premier League teams Man City and Tottenham in the knockout stages. Though both experienced setbacks this week, Liverpool and Man United are odds-on to join them. Former Chelsea star Frank Lampard has been suitably impressed. While it’s premature to get too carried away given that it’s still over five years since an English side last appeared in the final — when Lampard’s Chelsea beat Bayern Munich on penalties — the outlook currently appears promising from a Premier League perspective. If the situation remains the same after next week’s round of matches, the breakdown of teams in the last 16 will be as follows — England (5), Spain (3), Italy (2), Switzerland, France, Ukraine, Turkey, Portugal and Germany (all 1). Cases for the Premier League being the best in the world will seem more convincing with this statistical evidence to back it up. And of course, English clubs’ dominance is undoubtedly overdue at this stage — the crazy money being pumped into the Premier League is incomparable to anywhere else in the world. If anything, English clubs have underperformed, given their considerable riches, until recently. Email “Sloppy Man United made to pay and more Champions League talking points ”. Feedback on “Sloppy Man United made to pay and more Champions League talking points ”.